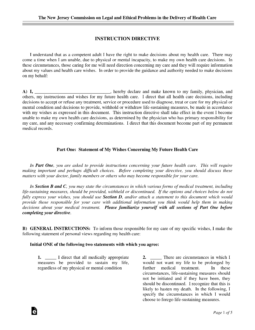 The New Jersey instruction directive, better known as a ‘living will’, is a document that provides instructions to the Declarant’s Medical team with regard to how they would like to have their end of life options honored when there are no other medical options to extend a quality of life. This document may be revoked at any time as long as the Declarant is of sound mind to do so. Medical Power of Attorney – Allows a person to select a proxy that is able to step in, if the patient cannot do so for themselves, and make any type of health care decision on the person’s behalf and in their best interest. Should you feel that none of the information adequately describes your wishes, then write into the lines provided, what your preferences are. 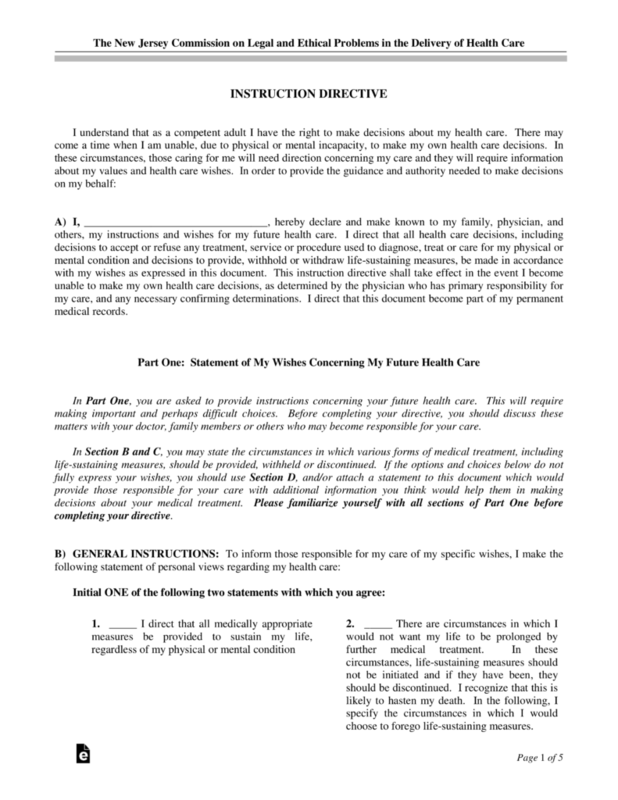 Step 4 – Additional Instructions: Should you feel that you would like your family or medical team to confer with one another before any decisions are concluded, write this information into the lines provided. If you could become or are pregnant, be very specific with regard to how you would like your medical care to be arranged. Step 5 – Addressing Brain Death – The state of New Jersey is very respectful with regard to how this aspect of end of life procedures are handled according to many aspects, religion being most important. The Declarant must carefully read this section of the document. If in disagreement based on religion or any other reason, initial the box below the statement, to ensure that your wishes are properly honored as they should be. Step 6 – After Death- Anatomical Donations – It is now possible to use human organs as research to increase the understanding of how to better heal the human body and even more importantly, transplant human organs and tissue in order to save and improve the lives of others. If you would be interested in becoming a part of this program, it’s asked that you indicate that if this is something you you would like to consider, that you would initial the areas that best fit your choices. Should you choose not to participate in this program, simply go to the end of the section and initial the section stating that you choose not to participate.